How to remove wallpaper border from an RV is one of my most commonly asked questions. 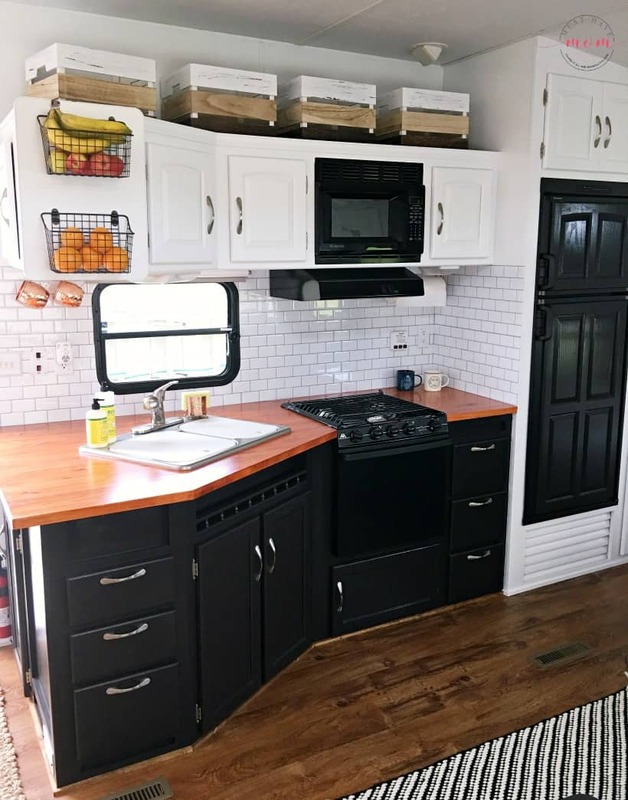 We have done two RV makeovers now and both of them had these atrocious wallpaper borders that had to be removed before we could paint. 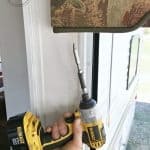 After testing multiple methods I stumbled upon this amazing trick that is by far the best way to remove wallpaper borders from an RV wall (or your house!). It’s so easy and saves so much time from previous methods I’ve used. 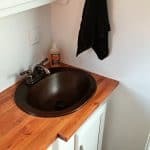 While we used this method I’m about to show you when we renovated our RV, you can use this on any wall, whether it is in your home or your camper. It’s fast, easy and it works! I’m so thrilled I stumbled upon this trick because I have spent way too many hours attempting to remove wallpaper borders and banging my head against the wall in frustration. I previously used this method to remove wallpaper borders in our last camper remodel. I have now discovered a FAR better way to remove the border that takes virtually no time at all and is chemical-free. Win-win! 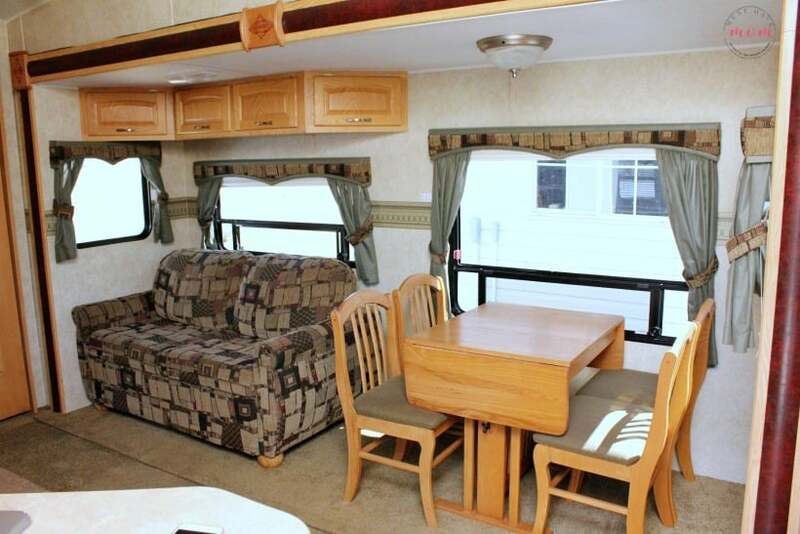 You’ll be hard pressed to find an RV that doesn’t have a wallpaper border and ugly valances. I’m not sure what it is about RV interior designers but they love their patterned borders and valances! First things first. Take down the curtains and ugly valances that block all the light! Here’s how to remove RV valances. Leave those down while you remove the wallpaper border and paint your camper. 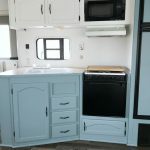 Here is a peek at our latest RV makeover before we did anything to it. It was full of ugly browns and greens that had to go! This time around I used my new wallpaper border removal method and it worked like a charm. I love finding things that just work. I’ve heard from numerous people that have tried it that they have also had great success with it. Here is what that same space looked like after we removed the ugly wallpaper border, painted and redecorated. Amazing transformation right? 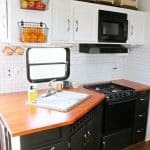 I’ll show you how to get started with this RV makeover by removing the wallpaper border quickly and easily! 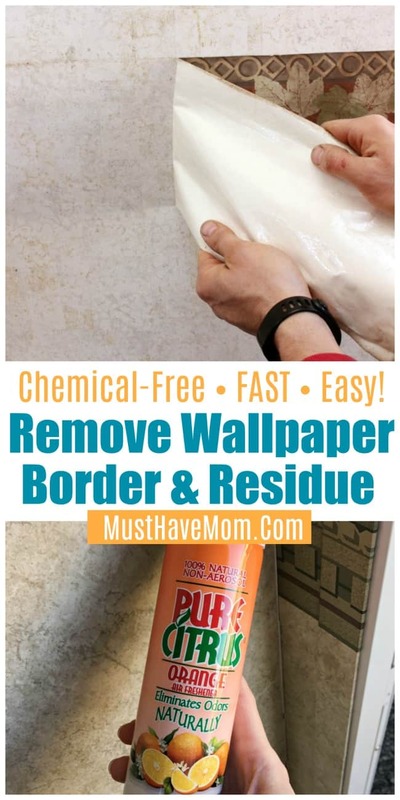 How To Naturally Remove Wallpaper Border Residue – Chemical Free! 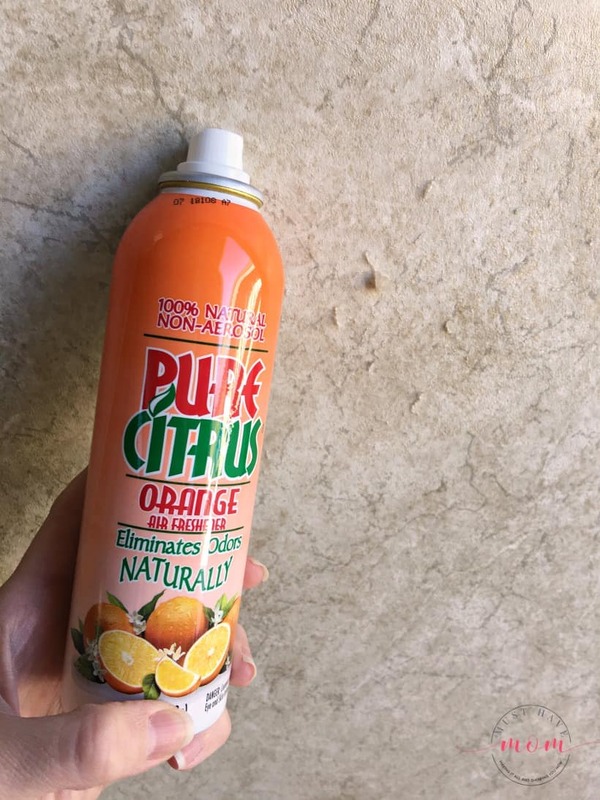 Pure Citrus Orange Air Freshener – this is a natural product that uses citrus oils. You can find it at Walmart in the air freshener aisle or order it online at Amazon. 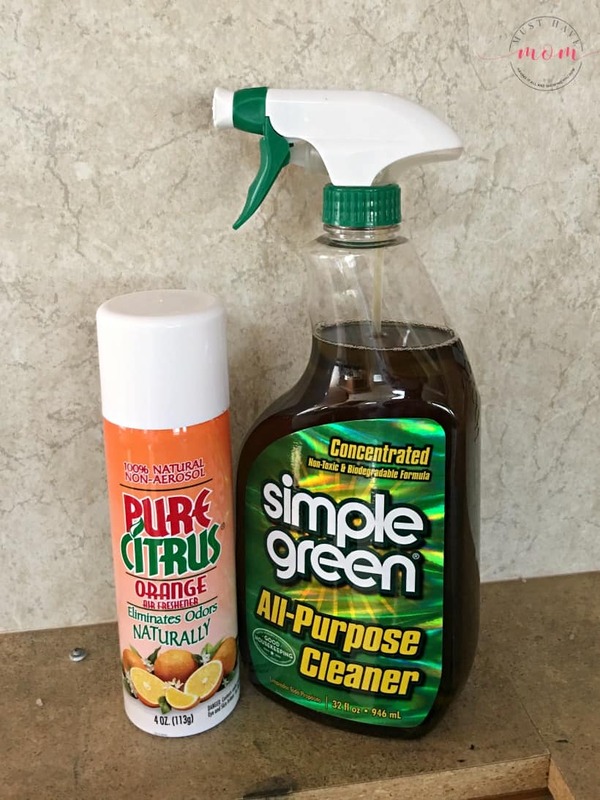 Simple Green All-Purpose Cleaner – This is a natural cleaner that works well to clean the walls before painting. To remove the wallpaper border you’ll first need to get an edge started and peel off the wallpaper border. We had several edges that were easy to get started. If you can’t get one started then spray some Pure Citrus orange air freshener on the edge to help release the glue. 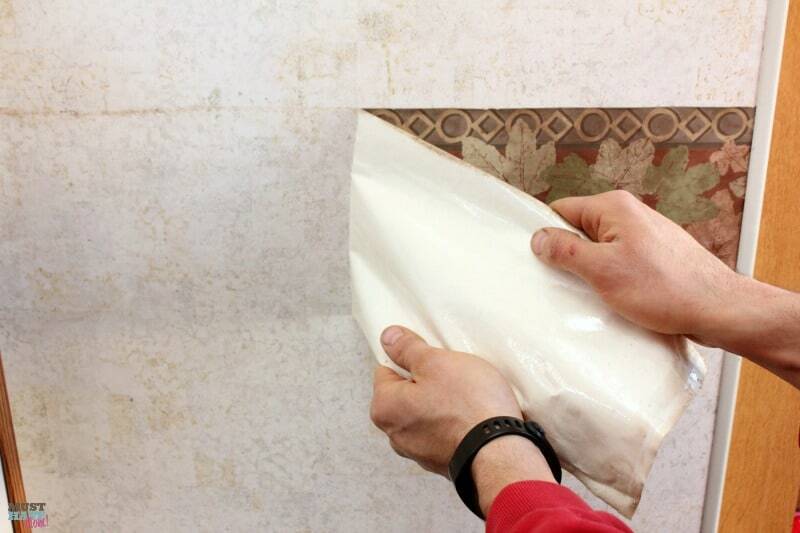 Once you get the edge started, carefully pull away the entire wallpaper border. You’ll be left with a sticky residue on the walls that will need to be removed before you paint. If you do not remove it before painting, you will see the texture through the new paint and it looks terrible (yes, I’ve done it). Don’t skip this step! In an RV all of the walls are wallpapered. These walls are NOT the same as a house would be. You MUST leave the wallpaper in place as it is glued to the wood paneling that make up the walls of your camper. You will paint over the wallpaper and only need to remove the wallpaper BORDER before painting. DO NOT, I repeat, DO NOT remove the wallpaper itself from your camper walls. 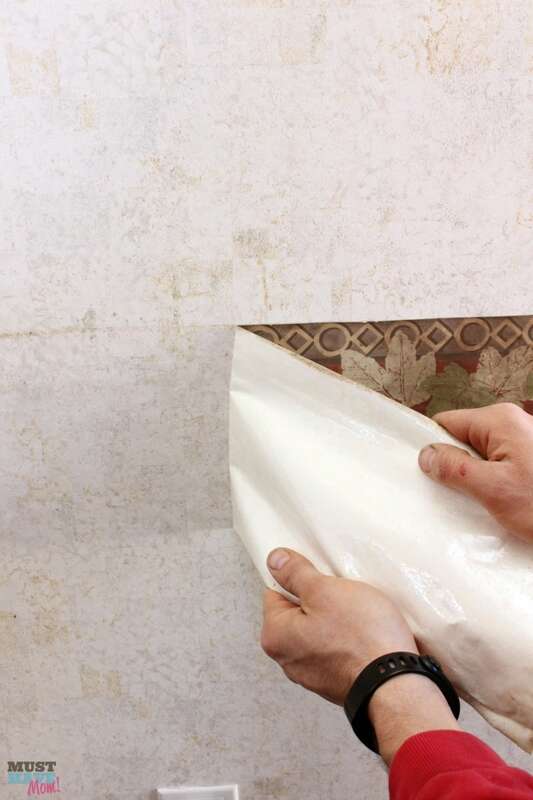 Once the wallpaper border has been removed, you’ll need to remove the sticky residue. Spray an even layer of Pure Citrus orange air freshener over the sticky area. Allow it to sit for a minute or so and you’ll see the sticky residue easily scrapes off and becomes a gummy texture. You can use a metal or plastic scraper to remove the gummy residue. It will easily wipe away from the wall. Remove all of the gummy residue from the wall. 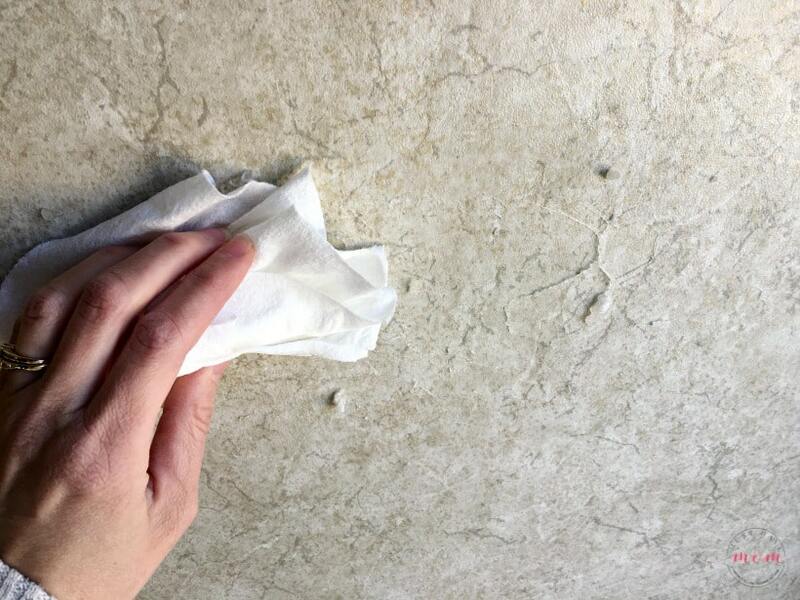 Once you have removed all of the gummy residue from the wall, spray with Simple Green cleaner and wipe clean with a paper towel. Allow the wall to dry completely before painting. This method to remove wallpaper border from a wall is the BEST method we have ever tried, and we’ve tried several! I have updated my previous post to recommend this method instead. I will be using this natural trick to remove the wallpaper border from now on in all of my future makeovers! You can see more photos from our latest camper makeover here. 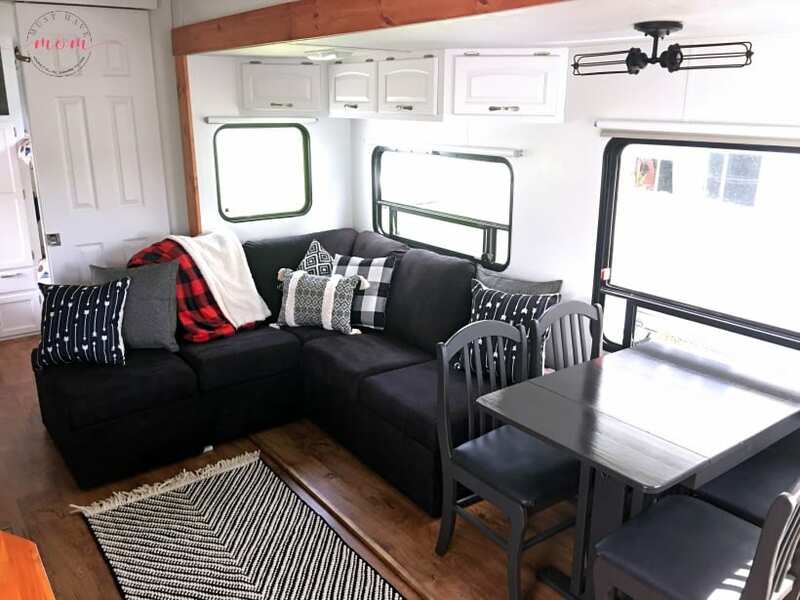 We did a cozy mountain vibe in our latest camper makeover and absolutely love the end result. Thank you for this! I’m definitely going to try this. I made the mistake of using Goof Off spray – do NOT use that – it will strip all color off your wall paper. Luckily I started in kitchen area so we can cover my mistake with stick on backsplash tiles. Oh no! Good to know. Thanks for sharing that tip! This stuff works so good. I hope you like it!